Retirement often marks a departure from the daily grind to the greener pastures of hard-earned leisure and relaxation. However, in certain cases, it represents a sea change of interests and endeavors. 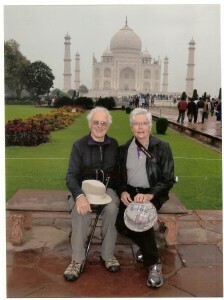 Retired CSUN English professor Bob Noreen (right) and his partner, Tom Green, at the Taj Mahal in India. Photo courtesy of Bob Noreen. Bob Noreen, a retired California State University, Northridge English professor who served as chair of the CSUN Department of English for six years, has ramped up his activity in his post-teaching career. These days, you’ll find him traveling the world and occasionally assisting the U.S. Department of Education, among other pursuits. Noreen began his tenure at CSUN in 1968 and retired officially in 2003 — but continued teaching part time at the university until 2008. He also has a decorated history developing and scoring writing assessments for U.S. students. He served as “chief reader and scoring leader” for the California State University system English Placement Exam until October 2106, and he helped develop and score the written portions of many notable exams — including the Scholastic Aptitude Test (SAT) — at various points in his career. Noreen’s vast experience in English led the U.S. Department of Education to seek his assistance in 2013. Department officials asked him to review and analyze documents associated with the development of Common Core State Standards Initiative assessments (standardized tests) for the 2014-15 school year. The Common Core curriculum sets the national standards for what students in grades K-12 should learn in public schools. The assessments with which Noreen helped were intended to measure students’ readiness for the transitions to college and the workforce, Noreen said. The Department of Education asked Noreen and four other educators what could be done to strengthen four different tests. The exams they reviewed were designed for grades five, eight and 11. This was the first instance of the U.S. Department of Education conducting a technical review of this sort, according to Noreen. Following the 2014-15 school year, Noreen was tapped again by the U.S. Department of Education to analyze the effectiveness of the exams he reviewed a year earlier. “They accomplished what they should do,” Noreen said about the assessments’ effectiveness. In addition to this hands-on work for the nation’s schoolchildren and educators, Noreen has found plenty of time to broaden his horizons. In particular, he has become a globetrotter, visiting 75 countries, most since his retirement. He said his goal is to travel to at least 100 countries within his lifetime. He named Spain, Italy, India, Bhutan and multiple countries along the Silk Road — including Kyrgyzstan and Uzbekistan — as his favorite destinations so far. Iceland and South Africa are next on his travel wish list. Noreen has embarked on his fair share of domestic adventures as well. He has traveled to every state except Alaska, which he aims to visit soon, and doesn’t shy from physically demanding outings. He has twice rafted 280 miles down the Colorado River through the Grand Canyon, and he has hiked to the summit of 23 peaks in the Sierra Nevada region — including two expeditions up Mt. Whitney, the tallest mountain in the contiguous U.S. He has climbed an additional 45 peaks in other mountain ranges across California and around the country. Some people approach retirement with an uncertain mentality, Noreen said. He advised soon-to-be retirees who are unsure of what to do, to be as active as their health allows. The key to enjoying one’s golden years, he said, won’t always be found by being sedentary.